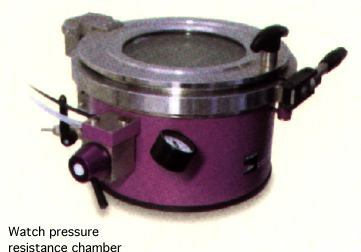 Here’s a picture of a pressure chamber which is used to test the pressure resistance of a watch. The watch is placed in this chamber and then it’s filled with water. The watch can be subjected to pressures of 10, 20 or 30 atmospheres for 30 minutes. Don’t try this at home…it will give you a wicked headache. I have read your previous post on the screw-in resistance tester also. I get the clear impression that the watch is actually subjected to real water pressure in these tests. Is this so? I had imagined that the watch case was subjected to air pressure only, in order to reveal any leakage in a non-destructive way. I can’t really reconcile having a watch damaged by water ingress during a resistance test, it doesn’t seem sensible. Please forgive my ignorance on this subject. There are essentially 2 methods of testing the impermeabilty of a watch case with the movement inside; the Rolex method and the Portescap method. The Rolex one uses water but still can not damage the movement here is how it works. The machine incoporates a glass tube one third filled with water which has a screwed top with a pressure guage and the bottom end sits on a vacuum pump. The watch is suspended from a hangar at the top of the tube and the air above the water is then sucked out. As the pressure inside the watch (normal air pressure) is now higher than that in the tube it will attempt to escape and equalise the pressure (nature abhors a vacuum and all that) if it does succeed in escaping from the case it will be seen as bubbles rising from the case. Simple really!! The Portescap system places the watch on a platform inside a vacuum chamber. The chamber is then evacuated of all air and a pointer is lowered until it touches the glass of the watch; the air in the watch is now at a higher pressure than that in the chamber (air pressue vs vacuum) and it will once again try to escape if it does so the case will suddenly contract as the pressure equalise and this will be registered on a micrometer guage connected to the pointer touching the glass. Both methods are what is known as non-invasive and/or fail safe; in other words it is impossible for the watch to be harmed by the testing methods. I hope this helps to explain; if not…please ask.